QUEENSLAND'S Environment Minister has called on boaties and aircraft operators to steer clear of any "humpback whale that was more than 90 per cent white" following the mass public interest in Migaloo. 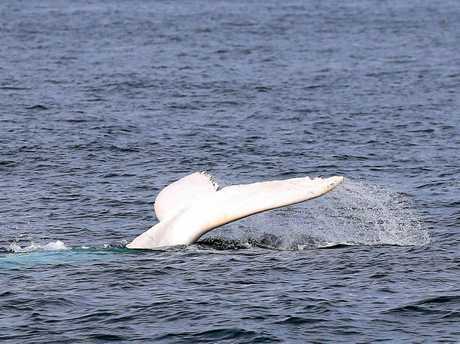 Dr Steven Miles said the Government's Special Management Declarations applied to the albino whale, which caused a frenzy when it was spotted off the East Coast yesterday. "These are special management marine mammals, which means boats and prohibited vessels must not approach within 500m and aircraft cannot approach within 610m, without authorisation," Dr Miles said. "These rules are in place to protect the whales and give them safe passage during their migration along the Queensland coast." Helicopters, charter boats, drones and research vessels were out in force to catch a glimpse of the animal. "It's what every whale watcher dreams of, but it is really important that this animal's space is respected and no undue distress is caused," Dr Miles said. 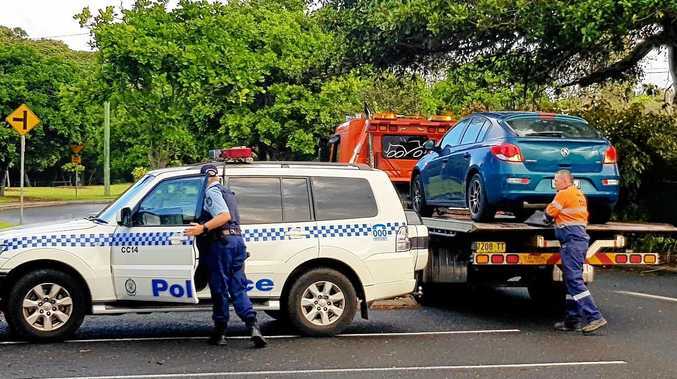 One complaint to the Government is being investigated while Queensland Parks and Wildlife Service is monitoring the whale today to ensure its safety. Dr Miles said the whale was smaller than Migaloo but there was no way of knowing without genetic testing whether they were related. The maximum penalty for intentionally moving too close to a whale is $20,113.50, or an on the spot fine of $609. Migaloo off the Tweed Coast: Short compilation of videos taken by Frey Swinburne and Alison Reid aboard the Whale Watcher on July 26, 2017. Migaloo, a rare white male albino whale, can be seen breaking the water nearby the vessel. 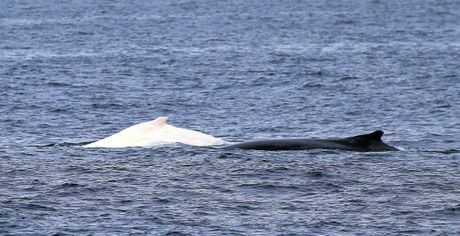 Experts can't seem to agree on whether or not the albino whale spotted off Tweed yesterday was Migaloo. Southern Cross and Griffith University whale researchers say Sea World was incorrect in its determination that the albino whale spotted yesterday was "Migaloo's son" when it was in fact Migaloo. A spokesman for Sea World has confirmed this morning experts now believe the albino whale spotted off the Tweed coast was the "son of Migaloo". MIGALOO, the albino humpback loved by whale watchers world wide made a splash today in seawaters with Mt Warning and the Tweed Coast offering a stunning backdrop. The Tweed Daily News was aboard the aptly named Whale Watcher for a special afternoon charter that left the marina at Tweed Coolangatta Golf Course at 1.20pm today with 25 others in the search for Migaloo. Whale Watcher skipper Terry Swinburne had received a morning tipoff that the rare white male had been spotted off Byron Bay. He was then sighted off Cabarita headland where dozens of people had gathered to catch a glimpse. Those on board Whale Watcher got their opportunity at about 2pm, when just Migaloo and his partner of six years surfaced in the waters off Salt, Kingscliff. Deckhand Sandy Riley-Wiradjuri said the moment of seeing the "famous white albino whale" was one of importance to the local indigenous community, especially with "Mt Wollumbin" in the backdrop. "I think it was meant to be, we have been manifesting our energy to bring him on," Ms Riley-Wiradjuri said. Another three boats were also in the area although all were careful not to break the International Whaling Commission's guideline that requires they not go within 500m of Migaloo. Hostess Ariana Were, who had seen Migaloo twice before, said normally their 50 foot catamaran had to stay 300m away from a mother and baby calf and 100m away for a normal humpback. "That's what you do it for, it's for that one time in four years that he comes through," Ms Were said. 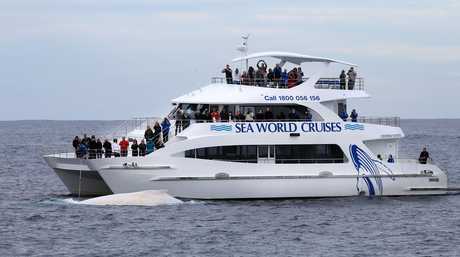 At about 3.30pm Migaloo's audience had increased to seven boats, including two from Sea World and a large tourist catamaran. It was then that he broke the surface right beside the Whale Watcher, much to the delight of those on board. The sighting left avid whale watcher Alison Reid of Byron Bay elated. "I'm very happy with that, after 20 years of whale watching it was the first time I had seen him so close," Ms Reid said. "It was Migaloo, the famous ice berg, it's the ultimate experience to see him, the pinnacle of whale watching, I just broke down and cried." Whales breach as a show of dominance, to frighten off predators and just for fun, however Migaloo did not breach this afternoon. On the way back to port Mr Swinburne said he was pleased to have found Migaloo. "To judge the safe 500m can be a challenge but we try to make a safe distance, unlike some other vessels who may have some trouble," he said. Mr Swinburne said Migaloo is the highlight of the annual southerly migration of humpbacks between September and November.